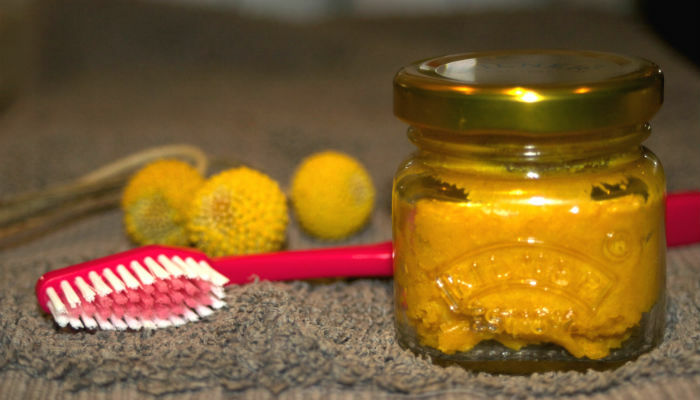 Want to get tough on toxins with this easy homemade turmeric coconut oil toothpaste recipe? This DIY toothpaste is 100% natural and doesn’t contain any of those artificial ingredients in popular brands of toothpastes that are almost impossible to pronounce…! Ingredients that Ramiel Nagel, in his highly rated book Cure Tooth Decay, argues may even do us more harm than good. The verdict? I really love it! It does takes a bit of getting used to, as the texture is a little different to commercial toothpaste. But my mouth and breath both feel clean and fresh and I love the fact I’ve made the toothpaste myself. Plus of course – it’s completely natural. 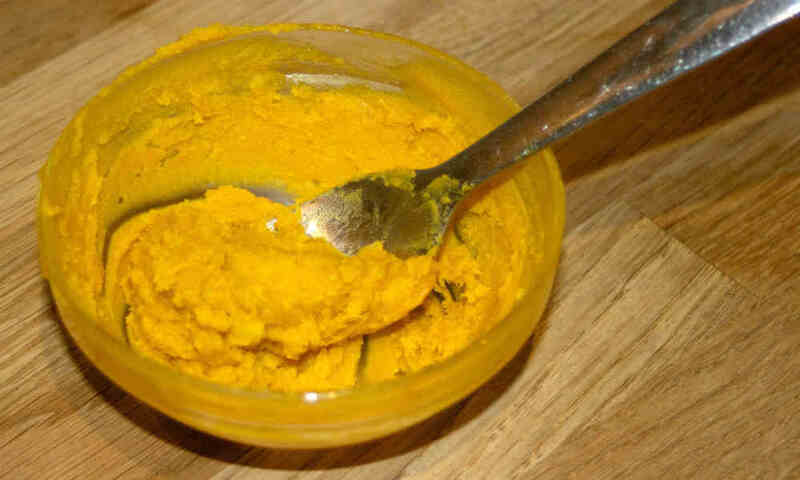 What’s So Great About Coconut Oil & Turmeric For Oral Health? According to the Indian Society of Periodontology, turmeric has comparable anti-plaque, anti-inflammatory and anti-microbial properties to more traditional mouthwashes. In fact, turmeric was shown to be very effective at preventing plaque build-up and bad breath, due to it’s anti bacterial properties (source). And with regards to coconut oil, a whopping 50% of the fat in coconut oil is comprised of something called lauric acid. Lauric acid is a medium-chain triglycerides (MCT) and is well known for its antimicrobial actions. It also inhibits Strep mutans – the primary bacteria that cause tooth decay (source). It’s interesting to note here that lauric acid is just one of 4 MCTs (or medium-chain triglycerides) in coconut oil and the other 3 are also considered very beneficial to health. 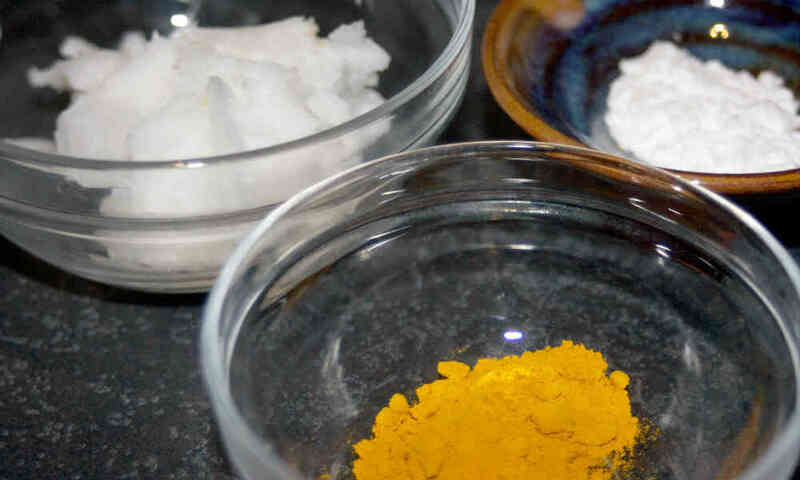 OK, so here’s how to whip up your own turmeric coconut oil toothpaste in 3 simple steps. *The baking soda as a gentle abrasive, but you can leave this out if you prefer. Pop your coconut oil, turmeric and baking soda into a bowl and mash well with a fork, until you get a smooth consistency, making sure all the ingredients are well combined. Note: Make sure the coconut oil is at room temperature, so it’s a softish consistency, or you’ll have trouble mixing it into the other ingredients. Put the paste into a small airtight container (I love small Mason Jars) and your turmeric coconut oil toothpaste is ready to use. As with any ingredients, fresher is better, so I tend to make a smallish amount of turmeric coconut oil toothpaste and then make more every week or so, or as needed. You can also add a few drops of peppermint oil for a fresher taste. Will I End Up With Yellow Teeth? That’s what I thought, but, no you won’t! Turmeric can indeed stain (you should see my tea towels), so use the toothpaste with care – however, it won’t stain your teeth. 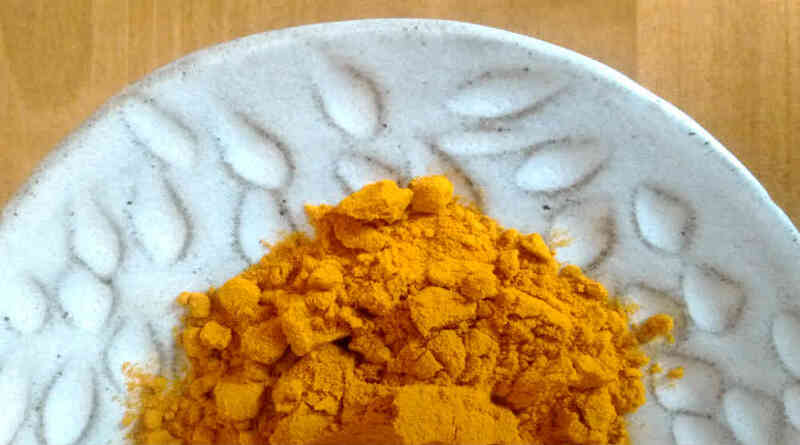 In fact, used on a regular basis, turmeric is considered by many to be a natural way to whiten your teeth (instead of the sometimes harmful teeth whitening methods readily available online or in some beauty salons.) Just make sure you rinse your mouth well and you’ll never know you had a bright yellow spice on your teeth at all! 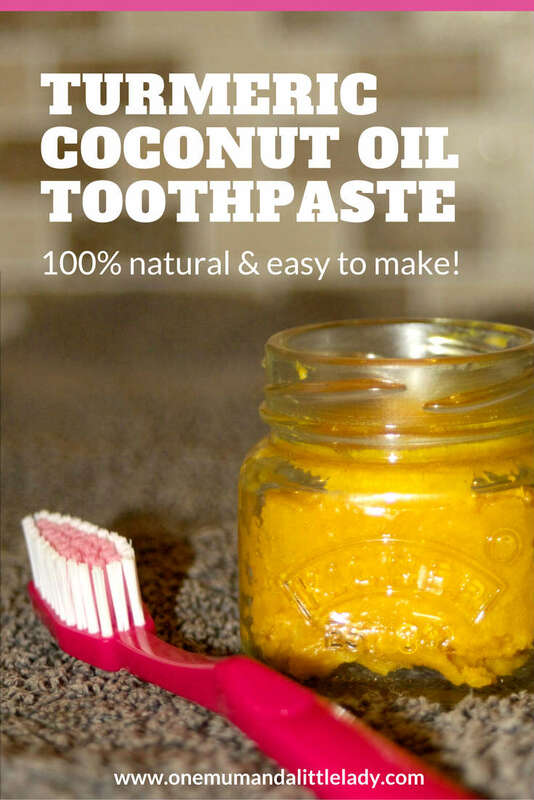 If you don’t want to use turmeric though, coconut oil, baking soda and a few drops of peppermint oil will also work just fine as a homemade toothpaste. Like anything, it’s best to try it out, see what you think and then, if necessary, adapt to suit your own personal preference. I love the fact turmeric coconut toothpaste is both completely natural and also cheap to make, plus I like the alkalising nature of the baking soda on my mouth. But it’s not for everyone, so another option which Ramiel Nagel strongly recommends in Cure Tooth Decay is a remineralising tooth powder. I live in the UK and have recently started using (and really like) Herbal Tooth & Gum Remineralising Powder by Laila London. I use this as well as my homemade toothpaste. 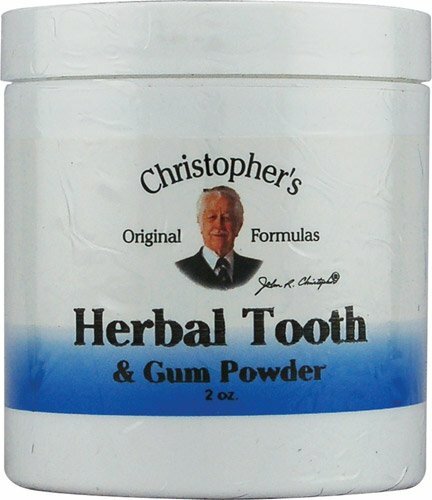 Another popular remineralising tooth powder is Christopher’s Original Tooth Powder. Ramiel Nagel also recommends this tooth and gum powder (only available in US I think). Whatever you choose to use, I hope it works well for you. 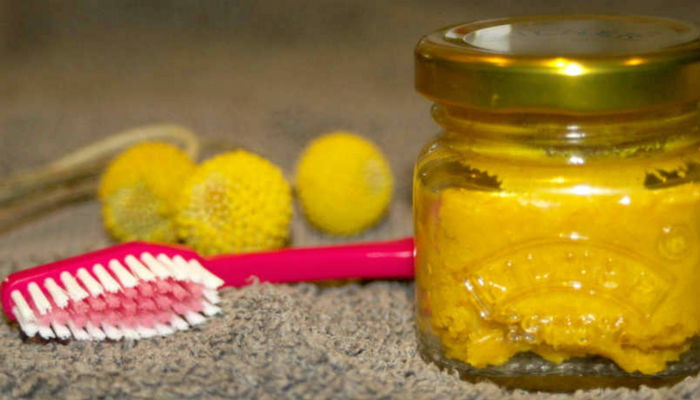 Have you made your own homemade toothpaste or natural remedy? How was it? Hi Lewis, it’s so easy to make, I tend to make a batch and keep it in an airtight container for a couple of weeks, then make another batch. To be honest, none of the ingredients have a short shelf life, so there is no reason why it wouldn’t last a lot longer. Hi. I have been been making my own toothpaste for a couple of months now, but have never used turmeric. I am excited to try it. Do you ever put pink Himalayan salt in your paste. I have seen multiple recipes that include it and wanted to hear your thoughts on it. Hi Stephanie, I’ve never used himalayan salt in toothpaste myself, I’d have thought it might be a bit abrasive, but it’s not something I’ve personally researched, so I couldn’t say for sure. Funnily enough though I have just today made some homemade mouthwash, using baking soda, spearmint drops, filtered water and a little Himalayan rock salt. It’s a recipe I picked up and adapted from Bruce Fife’s Oil Pulling Therapy Book if you wanted to try that. Why is remineralising powder considered an alternative option? Isn’t it worth just adding it too tomthe recipe? And for that matter maybe also some probiotic powder? Any thoughts on that? Also, any thoughts on flavouring the toothpaste for toddlers and children, other than with pepper/spearmint? Hi Assaf, as the remineralising tooth powder option is in a powdered form, i’m not sure it would mix well with the coconut oil/turmeric recipe. Turmeric is obviously a powder, but it’s added to the recipe above for it’s antibacterial properties, not remineralising ones. Essentially the recipe on this post is more about a natural alternative to shop bought toothpastes, which usually contain additives etc. The remineralising powder on the other hand is more about the minerals that are good for teeth and gums. I haven’t personally looked into combining the paste and powder, so I’m not sure what the outcome would be. Hi! Do you know of any alternatives to coconut oil? ?